Nowadays I really eat soba so frequently. That day we went to Shibamata to eat soba. Speaking of Shibamata, it is very famous as “Tora-san” and Shibamata Taishakuten temple. 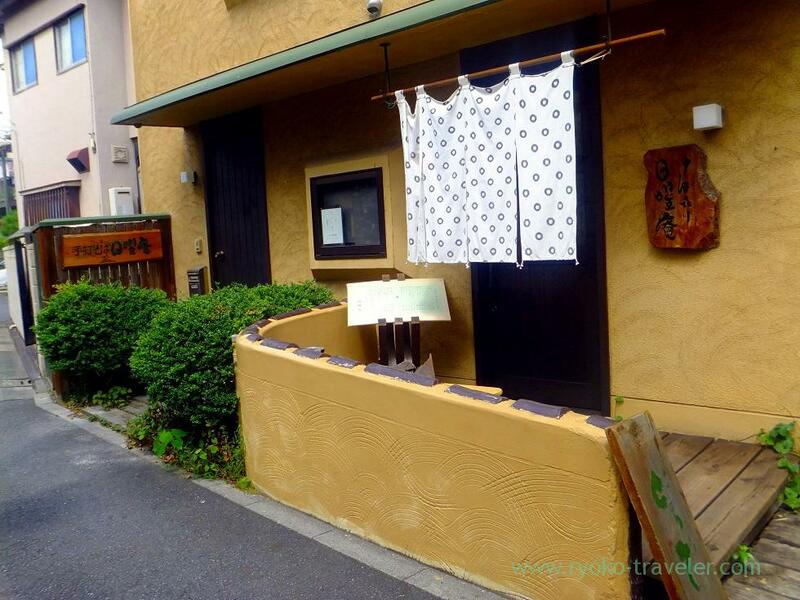 Shibamata have a soba restaurant that is open only from Friday to Sunday and another national holidays. 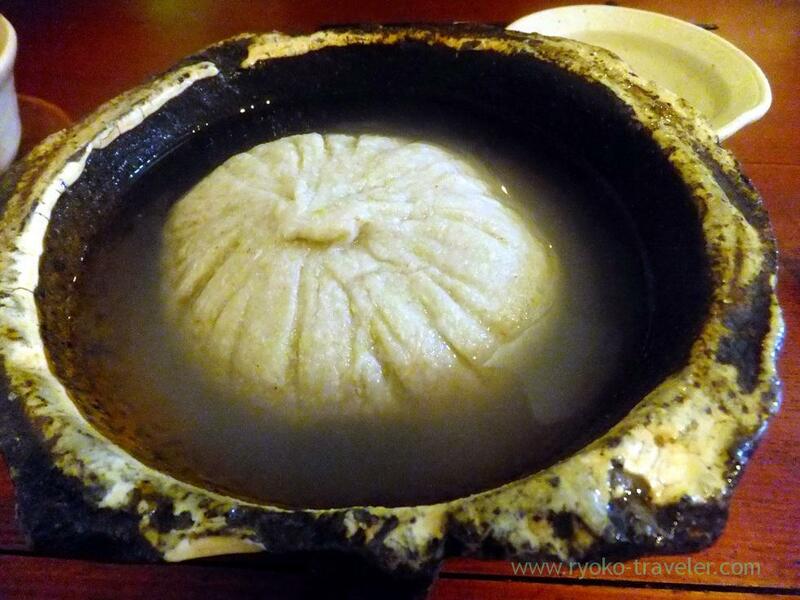 First, we ordered sobagaki (そばがき, 1250 yen). 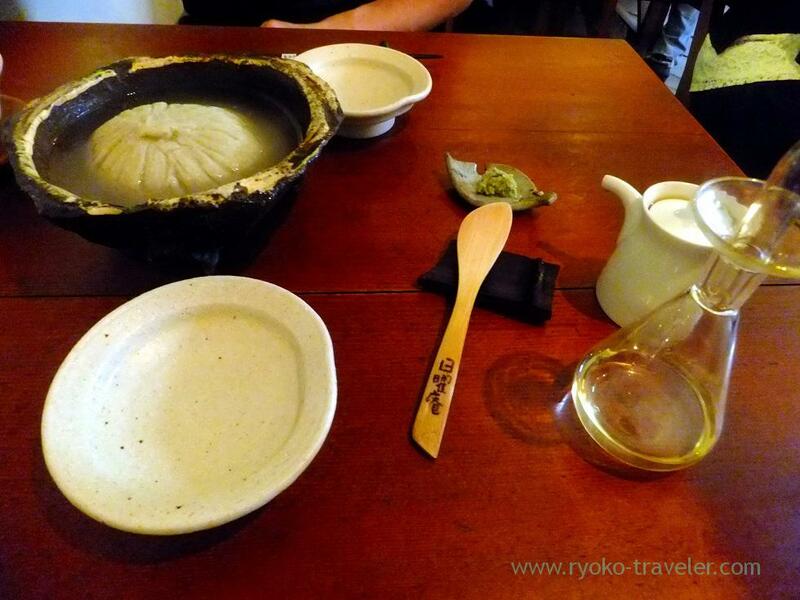 The sobagaki was brought to our table with wasabi and perilla oil. 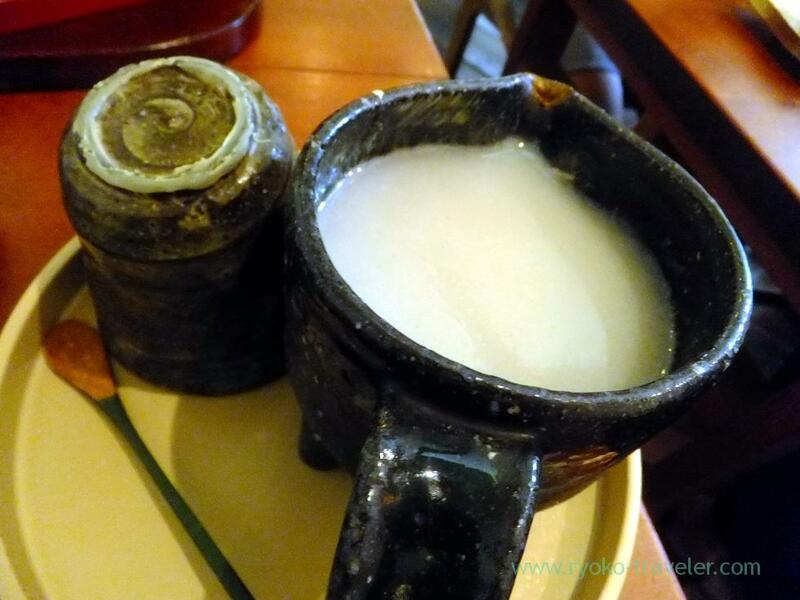 It’s texture was like freshly pounded rice cakes ! It’s very springy and tasty ! 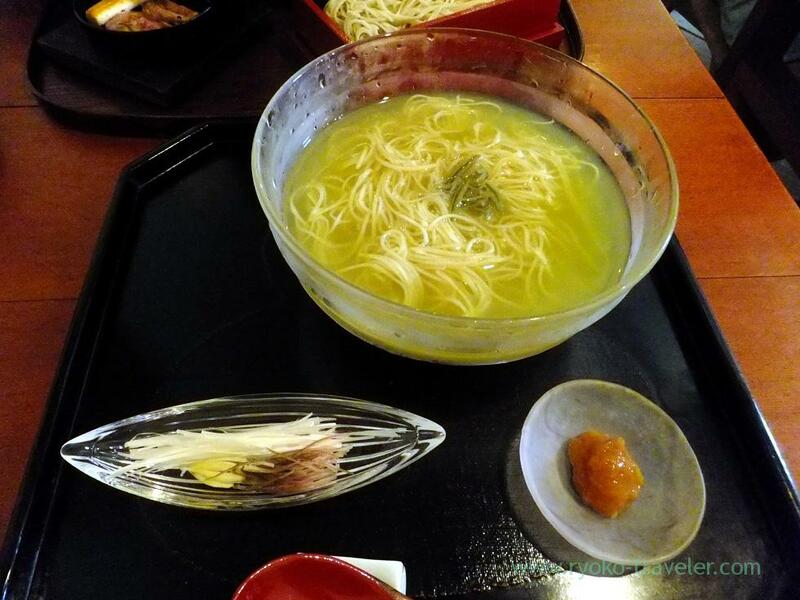 The flavor of soba was great ! And we ate it with perilla oil and also it was good. Delicate flavor of perilla spread in my mouth. After a while my soba came. My soba was Suzumi soba (涼みそば, 1430 yen). With Japanese ginger, green onions and plum. “Suzumi” means cool or cold in English. As its name, it is only Summer season. I think it won’t be served next month. Very narrow soba. 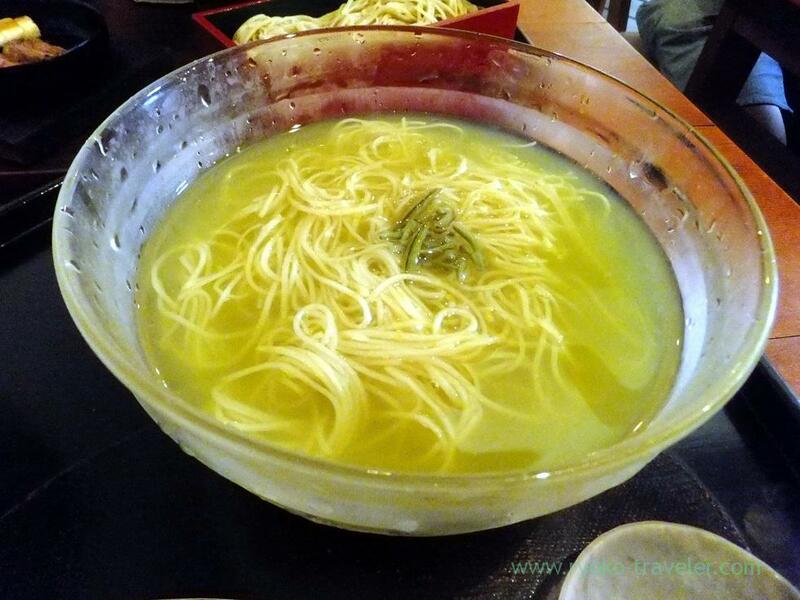 The soup have Laminaria ochotensis and green tea from Shizuoka prefecture. Delicate and light taste. I say honestly. I don’t like the soup. Elder lady next to us enjoyed it. I think I’ll be able to realize its quality after I’ll get older.